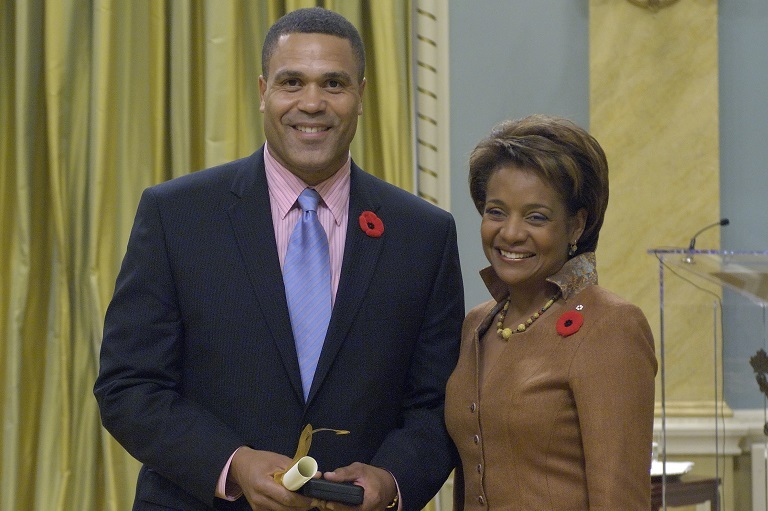 David Watkins accepting his award at Rideau Hall, 2007. Sgt Serge Gouin, Rideau Hall © OSGG, 2007. David Watkins believes that studying history is a key to self–determination. In his Canadian–African studies course students use the study of Canadian history to focus on their cultures' contributions to the multicultural fabric of Canada. He evokes inquiry into what it means to be black through a three–day Diaspora Youth Conference, and excursions to destinations relevant to the history of African Canadians. Students learn about historical inquiry, research skills and applying these skills to written, oral and visual formats while learning about African history in relation to Canada, United States and the Caribbean. Students define what being Black in Canada means. In one assignment students, after studying a newspaper article about the hero deficit within the black Community, create a super hero who addresses problems exclusive to black people. They design a costume and come up with abilities relevant to their environment. They also dream up a character flaw for their hero. The project concludes with the creation of a one–page comic strip. Another project is the Slave Mentality assignment in which students using video and class information write an essay on the slave trade, its motivation and rationale. They relate this to the current black experience with direct comparisons, contrasts and examples with reflection on students' lives. The final assignment is to create a family tree checklist detailing family and its importance in the black community, explaining any difficulties in obtaining information and reasons for this. All this culminates in the Youth Diaspora Conference. This conference is designed to educate, and enhance the student's knowledge of history and how it relates to them with an emphasis on using this information to guide their futures. They are exposed to professionals of African decent, each willing to offer their wisdom and experiences as a road map to success.